Here is a list of questions that I am frequently asked and the answers that I frequently give!! These questions and answers are of a general nature and if you have any further questions relating to anything for your specific party please do not hesitate to contact me. Number 1 - Top Of The Charts - How much do you charge for a disco? Every event can differ and so needs to be priced accordingly. The Contacts page outlines the basic information required to be provided:- Date, Type Of Function (Wedding, Birthday, Corporate, Seasonal Function etc), Venue Name, Are There Any Stairs To Negotiate? i.e. Is Function Room On First Floor or Above?, Number Of Guests Attending, Start Time, Finish Time, Is there any requirement to set up early? Get in contact and I'll provide you with a personalised quote for the entertainment you want. I might not be the cheapest but is this what you really want? I will sent you a booking form to sign and return - similar to this with your booking fee (approximately 25% of total fee). The form will set out the services you require for your event and payment details. When I receive your signed form and deposit, I will return a copy to you to confirm your booking. What events do you cover? Have a look on the Services page - this outlines the wide extent of JMF Discos experience and abilities - it's the personal approach and adaptability that makes JMF Disco so popular. If your type of event is not listed please contact me to discuss how I can help. The simple answer is the kind of music you want. When you book JMF Disco you have the choice of having as much input into the choice of the music for your event as you want - you can give me a complete playlist to stick to or let me know your favourite tracks you want played and I will mix them in seamlessly with guests requests on the night or let me know what types of music you enjoy and let me surprise you with selections to suit your type of event - requests are always taken on the night (so long as you want!). With a large library of music for all tastes, from the 1950s up to the latest chart tracks, JMF Disco will have the music for your event. If I don't currently have your favourite tune, I will purchase it for your special event. What equipment will the you bring? Does it include lights? JMF Disco will use professional sound equipment and effects lighting to suit the venue and the number of guests attending. The type of lighting can be varied to suit the style of your event and mood lighting can be provided to transform the look of your venue by washing the walls in colour. 'Intelligent' lights are used to give a fantastic display for your event. A smoke machine can also be provided to enhance the effect of the lights but please check that the venue allows the use of a smoke machine - we don't want fire alarms going off do we? We don't want a scruffy DJ turning up making me/us look bad, what will you wear? Our venue is asking to see proof of Public Liability Insurance? We hold £10m Public Liability Insurance cover, a copy of our current certificate is available on request. Our venue is also asking to see proof of PAT Testing of equipment? JMF Disco's Equipment is Portable Appliance Tested (PAT) annually to comply with the Health & Safety Guidelines by an independent electrical engineer. Equipment is also checked before erection and after dismantling at an event to ensure yours and my own safety. A copy of JMF Disco's current PAT test certificate is available on request. Generally I like to allow one and a half hours to set up for a 'standard' show - this gives plenty of time and ensures all the setting up is done before your early guests turn up. It takes one hour after the performance to dismantle and clear away the disco area. Setting up a large show will take longer and a smaller show will take less time. If you are having a celebration meal before the disco in the same room I would suggest that you consider taking advantage of my advance set up service to avoid disruptions during/after your meal. I am reliable and punctual arriving in plenty of time to set up, solving any problems that arise (why isn't that electrical socket working Mr Venue Manager?) and making sure everything is working before your guests arrive. How much room do you require to set the disco up in? A 'standard' show will require about 3.5 m x 2m, larger shows will require....yes you've guessed it a larger area. If space is a concern I can use a compact booth that will fit in the corner of a room with a diagonal frontage of about 2m - smaller if less lights are used. If you are worried that your venue will not have enough space I am always prepared to visit a venue to advise on the best setup if required. 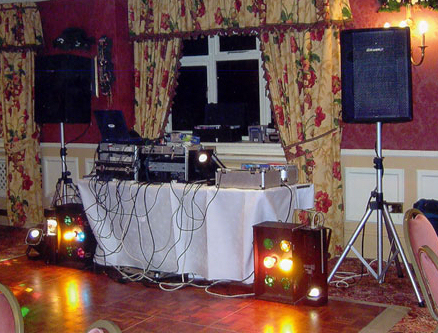 Unlike many discos, JMF Disco uses professional grade equipment that is very reliable and in the unlikely event of a breakdown duplicate equipment is always carried to ensure the show goes on. I hope the above has answered any general questions you may have and the rest of the website shows you what I am capable of, but if you have any questions, need advice or want to book please get in contact - I'm here to help. - I'm sure I can provide you with the party you really want!